08 | July | 2011 | K.I.S.S. Oh my goodness! This is a delicious combination! 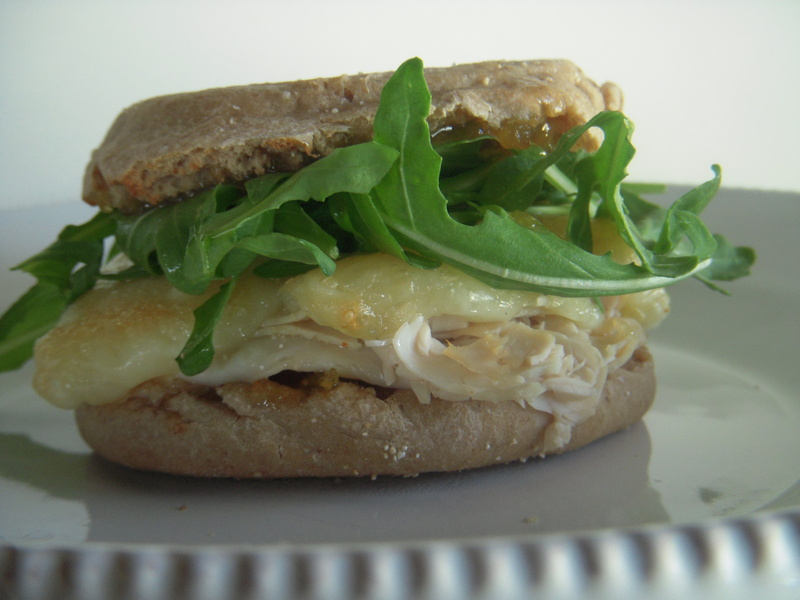 Turkey, brie, fig preserves and arugula-the perfect size on a 100% whole wheat english muffin. It’s so pretty too. It serves perfectly as a light lunch or even with an arugula salad for dinner. You can find the fig preserves at the grocery with the jellies. When buying turkey, I always buy Boar’s head low-sodium turkey from the deli. If your regular grocery does not carry Boar’s head, its worth finding one where you can pick some up. Boar’s head meats and cheeses contain no artificial fillers, colors, gluten, or trans fat. Once you try it, you will see the difference! Preheat oven to broil. On baking sheet, lay English muffins open. Spread about 1 T. of the fig preserves on each side of the muffin. On one side of muffin, put a good serving of turkey then top the turkey with the brie. Broil in oven until cheese melts. Remove from oven and fill with some arugula. Serve it just like that! Hope you enjoy as much as I do! !